PGA Instructors with 73 full time students from the Lee Westwood Golf School during their first visit to the Desert Springs Resort for a 4-day intensive winter training camp. The staff was always on hand to help us make the best of our training and I can´t think of anything that would have made my training at Desert Springs any better. That is the verdict of 18-year-old Olivia Jay, one of 73 full time students from the Lee Westwood Golf School based at Macdonald Portal Hotel, Golf & Spa in Cheshire and Stoke-by-Nayland Hotel Golf & Spa in Essex, who have returned from their first visit to the Desert Springs Resort for a 4-day intensive winter training programme to develop their individual golfing skills. Six Lee Westwood Golf School PGA Instructors accompanied sixty-eight boys and five girls aged between15 – 18 years for 4 days of warm weather winter training at the Desert Springs Resort between 14th & 18th January. 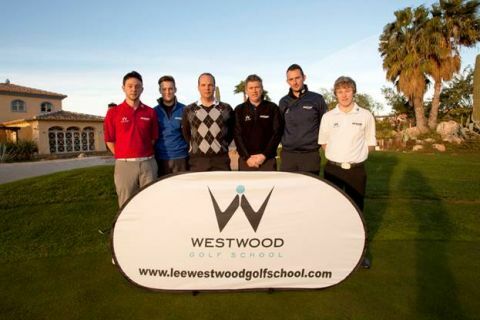 Lee Westwood Golf School PGA Instructors; Michael Welch, Gareth James, Rory Harrison, Simon Dainty, Elliot Jones and Mark Hetherington. The training camp utilised the excellent practice facilities at the Desert Springs Golf Academy where the PGA Instructors were able provide one-to-one tuition and take advantage of the use of the Desert Springs short game academy. Students working on there putting technique at the Desert Springs Short Game Academy. “The visual aspect of the Resort is unique, and it´s a great venue for golf for sure. I was aware of other squads and teams that have been here previously, and when they said it´s awesome they didn´t lie! The academy practice facilities are great and sufficiently big enough, even for a group of our size. A Lee Westwood Golf School student tees off on Hole 2 “Gulch” on the Indiana course at Desert Springs, Europe’s only international award-winning luxury family resort and championship desert golf course in the Almanzora region of Almeria in south-east Spain. “This being my first visit to Desert Springs, I was certainly impressed with the layout of the Resort; it was perfect in order to handle our group of students and keep them under control during the stay. We didn´t miss anything from outside of the Resort, hence we didn´t need to leave at anytime. The staff at the Resort always strived to help as much as possible; I couldn´t fault them. The standards of the Golf Academy and Indiana Course were ideal, including the full grass range. Accommodation for the Lee Westwood Golf School students and coaches was provided in the apartments available at Desert Springs. Desert Springs, Europe’s only international award-winning luxury family resort and championship desert golf course, is proving to be one of the most popular destinations for warm weather winter training camps among the growing number of schools with their own golf academies and teams, currently estimated at around 90 in the UK. In addition to Lee Westwood Golf School pupils, visiting groups have included golfing pupils from, Darren Clarke Golf School, Millfield School, Reading Blue Coat School at Sonning-on-Thames, King Edward’s School in Bath and Loretto School at Musselburgh near Edinburgh. During their stay pupils have opportunities to swim, play tennis and use the gymnasium, trim trail, jogging tracks, paddle tennis and beach volley ball courts. Desert Springs is easy to reach from the UK, thanks to three international airports. They are: Almeria Airport, around 40 minutes away by road; Murcia Airport, 80 minutes by car, and Alicante Airport which is a drive of less than two hours. Airlines currently flying to the region from the UK include easyJet, Monarch, Ryanair, Jet2, Jetair Fly and Thomas Cook. 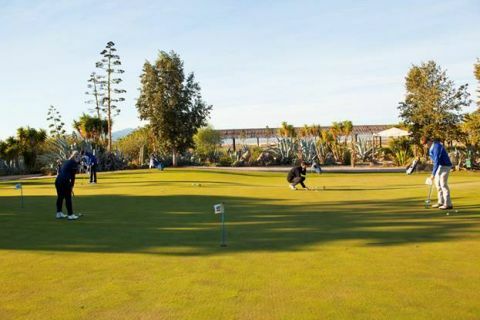 Already well known as a resort specialising in family holidays, Desert Springs is gaining popularity as a centre for warm-weather training for cricketers and footballers, as well as golfers. 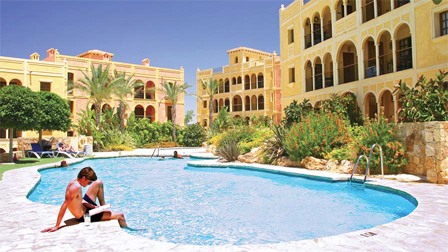 Accommodation is provided in the apartments and villas available for holidays and short breaks at Desert Springs. Meals are served in the resort’s Croc Restaurant, part of the family-friendly Crocodile Club that is geared up for a wide variety of leisure activities and the award winning El Torrente Restaurant at the Club House. A spokesman for Desert Springs said that, depending on the size of the group and its requirements, the total cost of a four-day trip for warm weather training, including flights, would work out at between £350 and £400 per person. NOTE: High Resolution Images available upon request.